Sweet Pepper Seedlings: How old? Seedlings are the beginning of any sweet pepper crop. 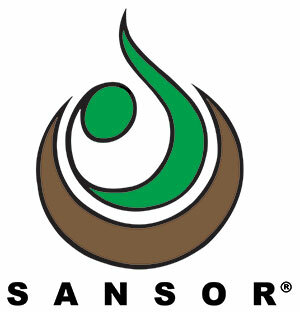 It therefore makes sense to pay particular attention to seedling quality. 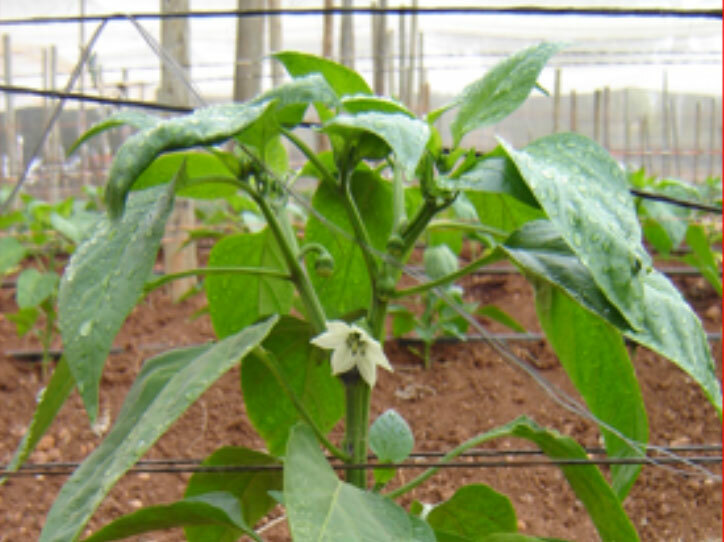 Sweet pepper seedlings tend to grow slowly and it became common practice to transplant them when they are ‘strong’ and the roots hold the medium nicely as shown in Figure 1. At this stage seedlings have 4 – 6 true leaves and are about 10cm tall. What happens if seedlings are transplanted when they are younger? Seedlings of several Sakata varieties were raised in trays with 200 cells at a commercial nursery in Mooketsi in May – June 2006. Stage 1-seedlings had only two true leaves, with the next ones just visible. The roots did not fill the cell and the medium was still loose. This made transplanting a little more difficult than normal. Stage 2-seedlings mostly had four true leaves and the roots filled the cell to hold the medium (Figure 1). Five weeks after sowing, Stage 1-seedlings were transplanted in soil under shadenet. Seven weeks after sowing, Stage 2-seedlings were transplanted. Two weeks after Stage 2-seedlings were transplanted (9 weeks after sowing) they were visibly smaller than Stage 1-seedlings. Six weeks after transplant of Stage 2-seedlings (13 weeks after sowing), the difference between the seedlings were very clear (Figure 2). 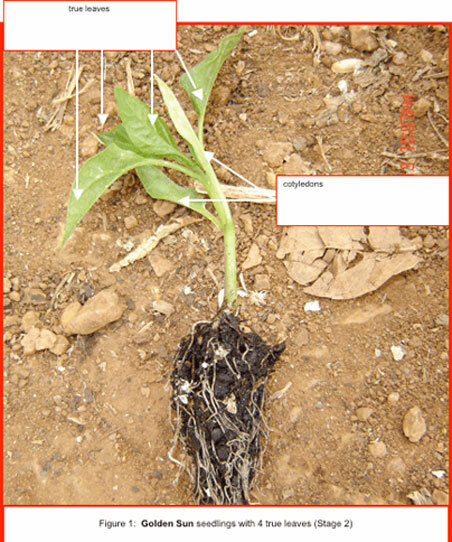 Plants of Stage 1-seedlings were generally stronger than plants of Stage 2-seedlings (Figure 2). To quantify the difference, the number of splits per plant and number of leaves on the stem before the 1st split, were counted on 2 X 10 plants of each variety. Most plants of Stage 1-seedlings had formed 3 splits, whereas these of Stage 2-seedlings, formed mostly 2 splits (Figure 3). It is interesting that plants of Stage 2-seedlings generally formed more leaves on the main stem before the 1st split. However, these leaves were smaller than those on Stage 1-plants, possibly indicating that the plant needed a specific total leaf surface before it had the capacity to split into three branches. 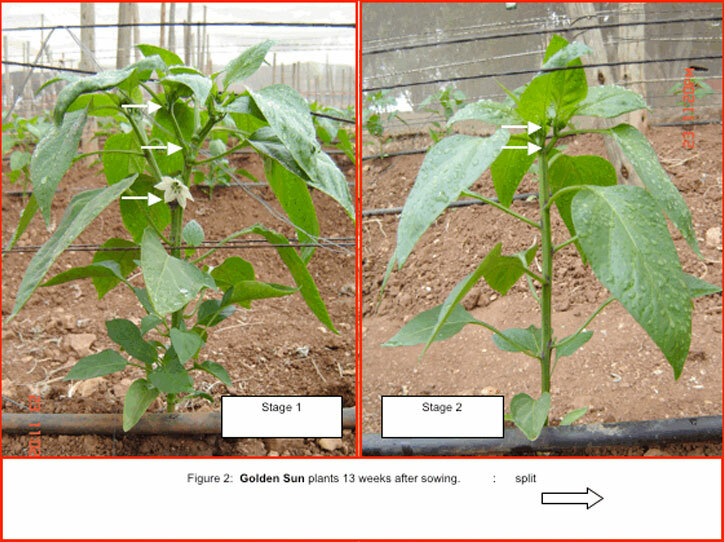 Another indication that Stage 1-seedlings established better than Stage 2-seedlings, is the number of side shoots that formed on the main stems of Stage 1-seedlings (Figure 2). Not all varieties responded in the same manner. It seems very important to transplant seedlings of the line MPS 0443 when they are young as Stage 2-seedlings lagged behind Stage 1-seedlings (Figure 2). Double Up on the other hand, appeared less sensitive to seedling age. Sweet pepper plants are known to have a poor root system. Growth of the root system normally slows down as soon as the first fruit set. It the taproot is damaged, or growth is hampered in any way (for example when the cell of the seedling tray become overgrown), it does not grow again. The plant then forms an adventitious root system, which does not grow as deep as a taproot system. If the seedling is transplanted before growth of the taproot ceases, the roots continue to grow deep and are able to support growth from day one, with the result that seedlings establish quickly and grow into a strong plant. Young sweet pepper seedlings (in this experiment with one pair of true leaves and root growth not restricted) are more difficult to transplant, but they establish quickly to form strong plants. If trays with bigger cells are used, seedlings can be transplanted later, as long as the root growth is not restricted in the cell. Limit damage to roots during transplant as far as possible: Handle with care, do not let them dry out and make sure the planting hole is big enough so the roots are not bent.